We recently investigated whether or not wearable tech will kill the password. It might not get there anytime soon and we've come to terms with that. But, at MWC 2016, there was still plenty to get excited about in terms of new ways for us to pay for stuff. Soon we will be paying with smart rings, fitness trackers and well, our faces, if Visa and MasterCard are to be believed. We discovered the new contactless payment devices we'll be using by the end of the year and tried out the zany biometric authentication that the payments giants are hoping will prove just as popular as contactless cards. Wearable tech really is feeling contactless payments right now. On Visa's MWC stand, we saw the upcoming second collection of luxe Topshop bPay accessories - a snakeskin-style wristband and metallic robot keyring - as well as the FitPay Smartstrap for Pebble Time watches and the Chronos disc which makes dumb watches smart via activity tracking, gesture controls and - soon it seems - contactless payments. "With some of these wearable form factors, it goes back to the ergonomics, they've really hit a sweet spot for contactless," said Jon White, head of strategy for mobile propositions at Visa Europe. "But I think cards are around for a long, long time to go. What's really going on is that there is an increase in the average number of devices a cardholder has. We're giving all of those a payment functionality but they are all tied back to me." MasterCard's line up of wearable payment projects now includes a new partnership to bring the tech to Hublot and Bulgari watches through WiseKey, as well as a whole list of wearables whose next iterations will handle contactless payments via its NFC wallet tech: Ringly, Moov, Omate am Atlas Wearables. The more attention these first waves of devices receive, the more startups and crowdfunding campaigns want to sign up to add NFC payments to their spec lists. "When we first announced the Coin partnerships back in October, the floodgates just opened. A lot of people are interested in this," Michael Friedman, MasterCard's VP of digital channel engagement, told us. "We're certainly hoping that by Christmas, some of these devices will be out. It really does add a level of stickiness for the consumer. Maybe I don't care about my steps anymore but I can at least pay with a wearable." Tapping a card or phone or wearable is just quick and fuss free and for "low value transactions" as White calls them, it works well. "In Europe, you get around a €13 average spend on contactless," he said. "Buying coffee, paying for lunch, TFL moving to tap to pay, that's been the heartland for contactless payments and I don't know whether the average transaction amount will necessarily rise." That said, both Visa and MasterCard are experimenting with authentication for more expensive purchases and new ways to handle those quick payments. White shows me a fingerprint scanning technology which reads all four fingers as you quickly wave your hand through the reader, rather than longpressing one finger. It works. "We can see this being used in fast food scenarios where you don't want to wait," he said. The focus isn't just on shops and cafes, though. MasterCard's headline grabbing "selfie pay" feature - aka its Identity Check platform - can be used to authenticate more expensive online transactions. Say you're buying something on your phone, there's a fingerprint scanning option which can access TouchID for example. Or you can hold your smartphone camera up to take a selfie, blink on command to prove you're not a photograph being held up by a phone thief. Then if it's you, the transaction is approved. See, selfie pay. It's designed to replace that SecureCode screen that pops up or one time passwords over SMS and it might sound gimmicky but seriously, just think of all the seconds you waste entering the same PINs over and over and over. A quick selfie doesn't seem so bad now, does it? 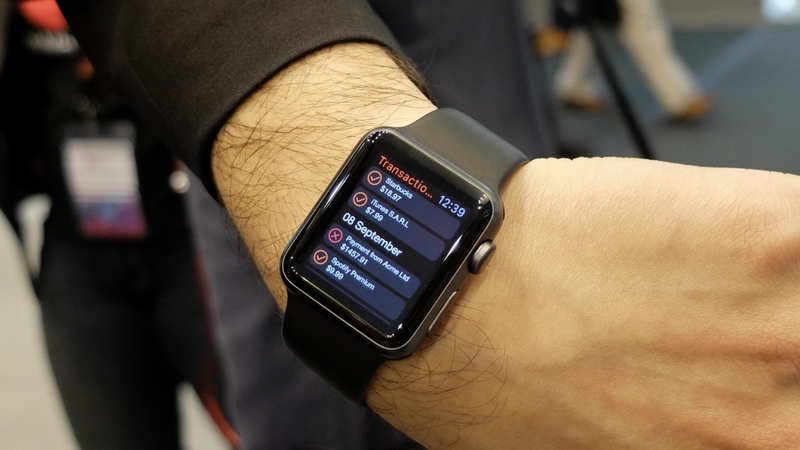 MasterCard is also working to use wearables like the Apple Watch to provide two device authentication for smaller items. Buy something on your phone - for instance ordering ahead at Starbucks (an example partner, not confirmed), then tap to confirm on the Apple Watch that the payment should go through. One of the niftiest demos at MWC 2016 was Visa and Honda's demo of paying for car parking and petrol from the driver's seat. Like the smart home (with its fridges which can pretty much now order your weekly groceries for you), the car is another space in which we buy stuff. So why should we get out to do it? So, for instance, a couple of taps on a touchscreen allows you to set the timer for when you leave your car parked and then when you return, you simply stop the timer and pay only for the time you spent there. Similarly, the fuel app concept featured both amounts of money to spend and an option to just fill up your car to full. The concept requires partners, of course, in the form of petrol stations fitting pumps with iBeacons and collaborations with car parking startups such as ParkWhiz but the payments are processed by Visa Checkout. The parking app is currently being tested in New York and the fuel app concept is being trialled in northern California for the next three months. Visa has experimented with letting drivers pay for everything from toll booths to pizza with its in-car payments systems but these two new trials, in particular, make a lot of sense.